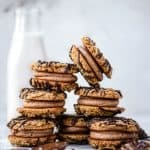 These peanut butter sandwich cookies are decadent, rich, and completely vegan and gluten free! In a medium size mixing bowl, cream the peanut butter and brown sugar at medium speed until no lumps are left. Add the vanilla and maple syrup and continue mixing at medium speed. Add the remaining cookie ingredients and mix until well incorporated. Scoop cookie dough onto parchment paper lined baking sheet. Press lightly with a fork to flatten. Bake for 11-13 mins, or until lightly browned. Remove from oven and let cool for 2 mins before transferring to cooling rack. Let cool completely before making cookie sandwiches! While cookies are baking, whip chilled coconut cream in small mixing bowl until a whipped cream texture forms. Add the peanut butter, sugar and cocoa powder and whip until smooth. Transfer to a small plastic bag and cut a small hole in one corner of the bag. Pipe desired amount onto one cookie, and use other cookie to form a sandwich.